Description: Multifresh Blast Chillers offer a variety of configurations and capacities and are well-suited for Bread, Pastry & Viennoiserie. All Irinox equipment carries ETL approvals for the US and Canadian markets. 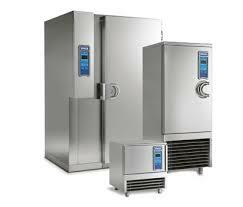 Whether you are a bakery store owner, pastry chef or other type of confectioner, Irinox commercial blast chiller and shock freezer can help enhance the quality of your creations and cut production costs while providing a well assorted display and reducing waste, to assure every good confectioner great success. DELICATE 0°F: this cycle is sub-divided into two stages (one at positive and one at negative temperature) and delicately shock freezes food. Particularly suitable for baked leavened products or bread. Please explore the specifications of the various models for the size and features that best meet your needs. & contact TMB Baking for additional questions.